Another sketch from the London Natural History Museum. This was sketched using a Derwent sketching medium wash 4B pencil and then "washed" by using a waterbrush over the sketch lines. Interesting. Need to play around with this pencil a little more. There is a wonderful drawing exhibit at the Courtauld Art Gallery at Somerset House. Guercino was the foremost Italian drawing artist during the 17th C. and his drawings are brilliant. The gallery also is displaying some Rembrandt drawings to enhance the exhibit. This is a quick sketch of St. Jerome that I did just to remember the joy of seeing his work. We walk by this pub several times each day and I finally sketched it. In spite of multiple visits to London over the past year, we still haven't gone to a pub. There are several in our neighborhood that I've been meaning to sketch, but I feel that I should at least stop by for a drink. 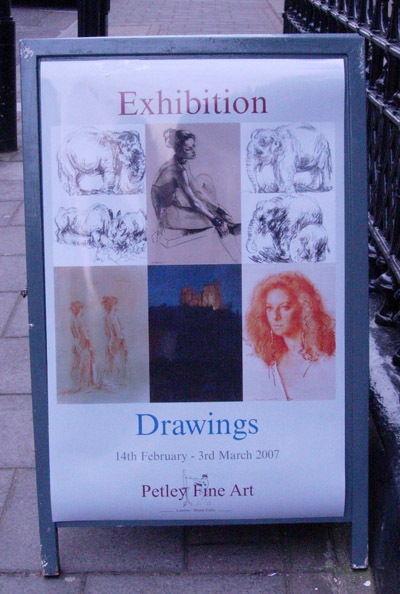 We found this wonderful "Drawings" exhibit at Petley Fine Art on Cork Street and I fell in love with the Elephants. I didn't record the name of the artist, but I suddenly developed the need to sketch elephants. 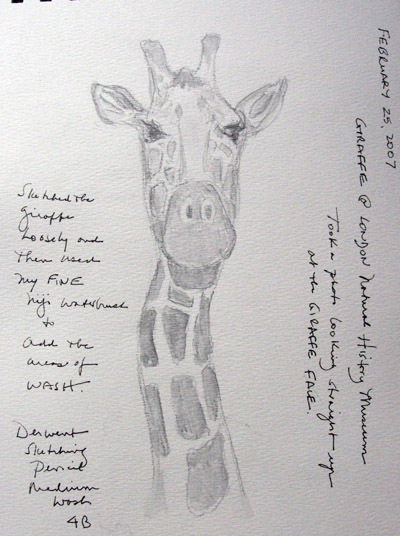 My husband and I went to the Natural History Museum several days later to fulfill this need and I sketched both elephant exhibits. Both of these sketches were done with a Derwent Sketching Medium Wash pencil - 4B. I loved using it and can't wait to see the effect of using water to create a wash. I'm sorry that I didn't do the sketches in pen - next time! Yesterday we went to the Mall Galleries for the first time. It was the first time that we went through Admiralty Arch since many, many years ago. I took a photo for this sketch because it was raining most of the time we were there. My husband and I went "gallery hopping" for several hours on Cork Street - primarily because the Helly Nahmad Gallery had 20 Picasso paintings from "La Californie" in an exhibit. We found several other wonderful exhibits and then stopped at our favorite coffee bar - Caffe Nero on Piccadilly. I thought that it was finally time to sketch the counter area for my travel sketchbook. Rachel and I took Callum for his first immunizations and when walking back along Sloane Street saw this interesting roof top (4 tops like this along the front of the building) and a cute little vacuum called Henry which was being used while changing a window display at Peter Jones Department Store on Sloane Square. I'm glad that I took a photo because it was gone by the time we took our Henry to see it. This is a photo of the building showing the elaborate fronts that are part of the otherwise plain rooflines on these beautiful Victorian buildings. We went early one morning this week to see the Hogarth exhibit at Tate Britain. It was crowded, but later there were long lines and even bigger crowds. I liked his engravings best and copied a few of the faces from one of my favorites - entitled "Characters and Caricatures." Yesterday was drizzly and we decided it was the perfect day to go to the National Gallery to see their exhibit "Manet to Picasso." It is a nice small exhibit - with many impressionist paintings on loan from the Tate and private collections. There is only one early Picasso. Since I am constantly trying to improve my skills drawing figures, I sketched this painting of Carlo Pelligrini (labeled Carol Pelligrini on the postcard I bought) by Degas. Our departure lounge at JFK in New York seemed crowded when we arrived for our early morning flight. The East Coast was paralyzed the previous day by a snow-ice storm and these were travelers left behind when their flight was cancelled. It gave me a unique opportunity, since I don't usually sketch people in these types of public spaces. I had 5-10 minutes before he changed position - just enough time for a quick sketch. We took the children to Harrod's toy department on Saturday - where there are numerous employees demonstrating all of the toys - and mechanical toys moving around on the floor all by themselves. Syd loved the plush mechanical pig that could found instantly by the helium balloon tied to her tail as she moved slowly between displays. Henry really liked the remote-control vehicles including the helicopter that was always flying through the air, as if by magic, as the Harrod's employee controlled its flight remotely. The elephant and giraffe were two of many near life-size stuffed animals and I used a photo I took of Syd to show their size. The sketch is a generic child - not my younger and really, really cute Sydney. Syd returned to this pig regularly during our visit. They also had a rabbit and two types of dogs similarly "walking" around with helium balloons marking their position. It was raining Sunday and I spent the afternoon home with baby Callum while everyone else went to the gym - for swims and a workout. While Callum slept, I sketched, but still haven't painted, the houses across the street. We are currently back in London with our fantastic grandchildren. That means less quiet time, more fun, and "news on the run." Since I have my laptop with me to keep up with work, I read the quick headlines on Google News which is displayed everytime I open the internet. We also see short segments of BBC news before or after Henry and Syd watch Dora or Diego. I'm trying to remember how to work with photographed (i.e. not scanned) sketchbook pages. I plan to upload my daily sketches from our trip soon.